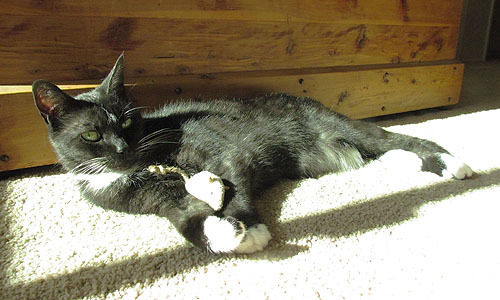 This morning Domino was basking in the sunshine playing with her new catnip mouse. (It’s the bright blob on top of her paws.) This afternoon will be a little more stressful, featuring another trip to the vet. Hopefully the news won’t be too bad. If you need an additional cat fix, check out this LA Times profile of the guy behind the Henrí videos. I didn’t know this, but it turns out Henry is his neighbor’s cat. He himself lives alone. It takes all kinds, I guess.